Spring fever. Oh it’s in the air. Days are getting longer. Which means my commute home is no longer in the dark and sometimes when I’m feeling extra ambitious, I can even get a little time with the pups on the trail before the sun goes down. And daylight savings, and with it more sunshine, is right around the corner! Birdies are chirping when I wake up in the morning. I’m eating healthier. I’m completing to-do lists. I’ve suddenly got more energy and excitement for life. Perhaps I’ve awoken from winter’s slumber. Does anyone else feel this kind of enthusiasm in the air? I can literally feel my eyes opening wider. As a farmer, or maybe just a lifelong Wisconsinite, I’m beginning to feel connected to the seasons. My energy levels. My emotions. My ambition. It all kind of flows with the solstice. In summer I’m alive and always moving. In fall I’m relaxed and unburdened and ready to enjoy the beauty that surrounds me. In winter I’m somber and almost lackluster at times. And in spring I’m filled with excitement and joy about all that lies ahead. In the midst of winter sadness I sometimes get angry at the cool months and even tell January that I hate him. But today, I’m full of spring positivity and I’m beginning to understand winter’s importance. It’s my time of rest and regeneration, of reflection and self-evaluation. It’s my time of the year to mentally sleep so that I can be fully awake for the rest of the year. So today, because I respect and appreciate winter (instead of my usual grumpy resentment), I’m celebrating the food of our hibernation (instead of whining about the lack of spring produce in my daily life). Enjoy the parsnips. Enjoy the Brussels Sprouts. Enjoy the garlic and onions you’ve still got in storage. Enjoy the California-grown scallions and the pop of brightness they bring into your life. Enjoy the probably Mexican avocados because remember that whole California drought? Enjoy the pounds and pounds of pork sausage in your freezer (oh, is that just me?). Enjoy it all. Because spring has almost arrived. And it’s almost time to only eat the seasonal things you grow (oh, is that just me too?)! My darling Carrot is not a fan of parnsips especially for breakfast and especially in hash. He is not usually wrong, but about this he is and let me tell you why, because it is fundamental to your appreciation of the vegetable. My Carrot looks at a cooked parsnip, especially when eaten for breakfast, and desperately wants it to be a potato. He loves breakfast potatoes of all types. A parsnip is starchy, it’s white, it’s a root vegetable. In hash, a parsnip even looks like a potato! He bites into parsnip hash and he so deeply wants it to taste like a potato that he doesn’t like the parsnip’s flavor. But if he bit into the hash expecting something else, expecting the parsnip’s divergent flavor with it’s own merits and not only on the basis that it is “not a potato”, I think he would be able to like it. But alas, not yet. Preheat the oven to 400 degrees. 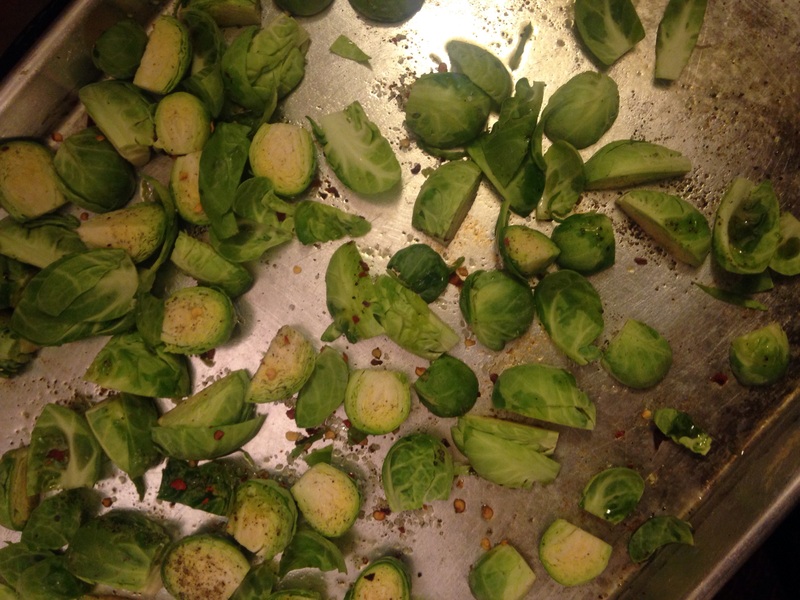 Prep your Brussels sprouts by cutting them in half (quarter especially large ones; leave especially small ones whole). Toss with olive oil, 1/2 teaspoon salt, generous amount of black pepper and red pepper flakes. Place on a baking sheet and bake for 25-30 minutes or until nicely brown and crispy around the edges, turning occasionally for even browning. Put parsnips in large oven-proof skillet. Cover with water. Simmer over medium heat for 3 minutes. Drain and set aside. Melt butter in same large skillet. Add onion along with 1/2 teaspoons salt and more freshly ground black pepper. Cook for 5 minutes over medium-low heat until soft. Add garlic and cook 3 minutes longer. 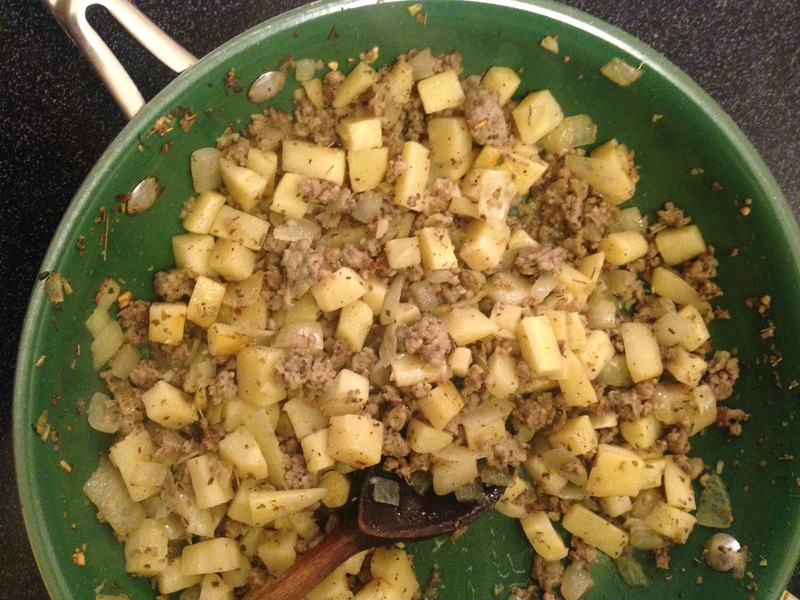 Add cooked parsnips, pork sausage and sage. (Feel free to leave out the pork sausage if vegetarian or sub in seitan or tempeh instead). Turn heat to medium-high and cook for 20 minutes, stirring every couple of minutes. The idea here is to brown the parsnips but not burn them. Your pan should be so hot that you can leave it for 2 minutes without stirring and when you come back, things will just be nicely browned. If the parsnips or onions burn in 2 minutes, your pan is to hot. After things are nicely browned, put pan in the oven. Roast for 10 minutes. (This timed nicely for me, as my Brussels sprouts had exactly 10 minutes left). Toss hash with roasted Brussels sprouts and raw scallions. 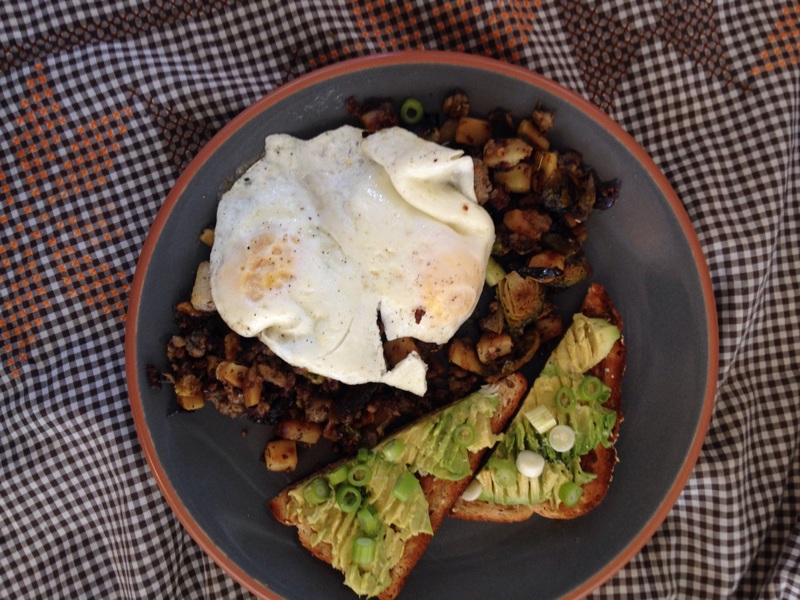 Top with eggs and eat with a side of avocado toast (see below) if you feel like it. Leave out the avocado toast (but maybe still eat the avocado) if you are paleo or gluten-free. Also sub olive oil for butter in the hash if you’re paleo. Cut avocado in half. Take out the pit. Slice each half into 4-5 long pieces inside the “shell” (rind? I don’t know what the skin is called..). Scoop out the slices with a spoon. Put half an avocado on each piece of toast. Mash with a fork. Sprinkle with scallions. Add plenty of Kosher salt. Try not to demolish immediately!